If you modify the strings in your software product during the localization process, you can always update them in your POEditor project too, to sync with the newest version of your software, while neatly keeping just the data you need in your localization project. To do this, go to the project page and click on Import terms in the menu on the right side of the page. Then, select the new localization file that you want to use to update the strings. The default import setting is Import terms only, but you have the option to Also import translations to... a particular language in the POEditor project. If you want to overwrite the translations in the POEditor project with the ones in the new localization file, check the box that says overwrite old translations. If you do not check this box, only the empty translation fields in the POEditor localization project will be updated with translations from the imported file. On import, you can also use Tags to organize the terms in your software localization project. You can choose to tag all the terms in the imported file, the terms that are new to the project, the obsolete terms (which are in the project but not in the imported file) and the terms with changed translations. After setting what you want to import from the new localization file in the Import File page, if you have no obsolete terms in the project, you will be taken to the View or Add Terms page. In case you do have obsolete terms, you will be taken to a page that lists all of them, where you can choose which to keep in your software localization project and which not. 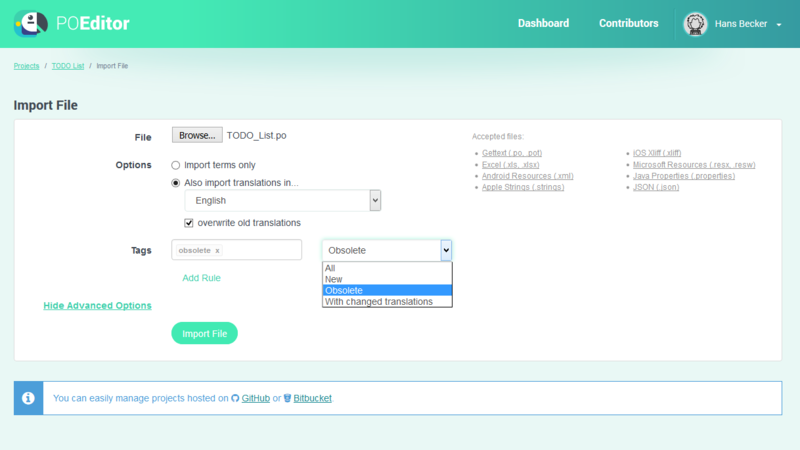 If you choose to import translation too, and all of the imported translations match the old ones, you will be taken to the translation page of the language to which you chose to import the translations. Note: The only way to have duplicates in a POEditor software localization project is by importing indentical terms with different context.